For other ships with the same name, see HMS Audacious. HMS Audacious was the fourth and last King George V-class dreadnought battleship built for the Royal Navy in the early 1910s. After completion in 1913, she spent her entire career assigned to the Home and Grand Fleets. She was sunk by a German naval mine off the northern coast of County Donegal, Ireland, in October 1914. The King George V-class ships were designed as enlarged and improved versions of the preceding Orion-class battleship. They had an overall length of 597 feet 9 inches (182.2 m), a beam of 89 feet 1 inch (27.2 m) and a draught of 28 feet 8 inches (8.7 m). They displaced 25,420 long tons (25,830 t) at normal load and 27,120 long tons (27,560 t) at deep load. Audacious's crew numbered 860 officers and ratings in 1914. Ships of the King George V class were powered by two sets of Parsons direct-drive steam turbines, each driving two shafts, using steam provided by 18 Yarrow boilers. The turbines were rated at 27,000 shaft horsepower (20,000 kW) and were intended to give the battleships a speed of 21 knots (39 km/h; 24 mph). Audacious carried enough coal and fuel oil to give her a range of 5,910 nautical miles (10,950 km; 6,800 mi) at a cruising speed of 10 knots (19 km/h; 12 mph). Like the Orion class, the King George Vs were equipped with 10 breech-loading (BL) 13.5-inch (343 mm) Mark V guns in five hydraulically powered twin-gun turrets, all on the centreline. The turrets were designated 'A', 'B', 'Q', 'X' and 'Y', from front to rear. Their secondary armament consisted of 16 BL 4-inch (102 mm) Mark VII guns. Eight of these were mounted in the forward superstructure, four in the aft superstructure, and four in casemates in the side of the hull abreast of the forward main gun turrets, all in single mounts. Four 3-pounder (1.9 in (47 mm)) saluting guns were also carried. The ships were equipped with three 21-inch (533 mm) submerged torpedo tubes, one on each broadside and another in the stern, for which 14 torpedoes were provided. The King George V-class ships were protected by a waterline 12-inch (305 mm) armoured belt that extended between the end barbettes. Their decks ranged in thickness between 1 inch (25 mm) and 4 inches with the thickest portions protecting the steering gear in the stern. The main battery turret faces were 11 inches (279 mm) thick, and the turrets were supported by 10-inch-thick (254 mm) barbettes. Available sources do not acknowledge that Audacious was fitted with a fire-control director on the roof of the spotting top before her loss, but photographic evidence shows one visible as she was sinking. Ordered under the 1910–1911 Naval Estimates, Audacious was the third ship of her name to serve in the Royal Navy. The ship was laid down by Cammell Laird at their shipyard in Birkenhead on 23 March 1911 and launched on 14 September 1912. She was completed in August 1913 at a cost of £1,918,813, but was not commissioned until 15 October, joining her sister ships in the 2nd Battle Squadron. All four sisters represented the Royal Navy during the celebrations of the re-opening of the Kaiser Wilhelm Canal in Germany in June 1914. Between 17 and 20 July, Audacious took part in a test mobilisation and fleet review as part of the British response to the July Crisis. Arriving in Portland on 25 July, she was ordered to proceed with the rest of the Home Fleet to Scapa Flow four days later to safeguard the fleet from a possible surprise attack by the Imperial German Navy. Following the outbreak of World War I in August, the Home Fleet was reorganised as the Grand Fleet, and placed under the command of Admiral Sir John Jellicoe. The following month, the ship was refitted at HM Dockyard, Devonport, and rejoined the Grand Fleet at the beginning of October. Repeated reports of submarines in Scapa Flow led Jellicoe to conclude that the defences there were inadequate and he ordered that the Grand Fleet be dispersed to other bases until the defences were reinforced. On 16 October, the 2nd Battle Squadron was sent to Loch na Keal on the western coast of Scotland. The squadron departed for gunnery practice off Tory Island, Ireland, on the morning of 27 October and Audacious struck a mine at 08:45, laid a few days earlier by the German auxiliary minelayer SS Berlin. Captain Cecil Dampier, thinking that the ship had been torpedoed, hoisted the submarine warning; in accordance with instructions the dreadnoughts departed the area, leaving the smaller ships behind to render assistance. The explosion occurred 16 feet (4.9 m) under the bottom of the ship, approximately 10 feet (3.0 m) forward of the transverse bulkhead at the rear of the port engine room. The port engine room and the outer compartments adjacent to it flooded immediately, with water spreading more slowly to the central engine room and adjoining spaces. The ship rapidly took on a list to port of up to 15 degrees, which was reduced by counter flooding compartments on the starboard side, so that by 09:45, the list ranged up to nine degrees as she rolled in the heavy swell. The light cruiser Liverpool stood by, while Jellicoe ordered every available destroyer and tug out to assist, but did not send out any battleships to tow Audacious because of the supposed submarine threat. Having intercepted the stricken dreadnought's distress calls, the White Star ocean liner RMS Olympic, sister of the RMS Titanic, arrived on the scene. The ship could make 9 knots (17 km/h; 10 mph) and Dampier believed that he had a chance of making the 25 miles (40 km) to land and beaching the ship, so he turned Audacious south and made for Lough Swilly. After about two hours, the ship had covered 15 miles (24 km) when the rising water forced the abandonment of the centre and starboard engine rooms and she drifted to a stop. Dampier ordered all non-essential crew to be taken off, boats from Liverpool and Olympic assisting, and only 250 men were left aboard by 14:00. At 13:30, Captain Herbert Haddock, the captain of Olympic, suggested that his ship attempt to take Audacious in tow. Dampier agreed, and with the assistance of the destroyer Fury, a tow line was passed 30 minutes later. The ships began moving, but the line was severed when it was fouled by the cruiser's propellers. Liverpool and the newly arrived collier SS Thornhill then attempted to take the battleship in tow, but the line snapped before any progress could be made. Vice-Admiral Sir Lewis Bayly, commander of the 1st Battle Squadron, arrived on the scene in the ocean boarding vessel Cambria and took over the rescue operation. Upon learning that two ships had been mined in the area the day before, and that there was no threat from submarines, Jellicoe ordered the pre-dreadnought battleship Exmouth to sail at 17:00 for an attempt to tow Audacious. Dampier ordered all but 50 men to be removed at 17:00 and Bayly, Dampier and the remaining men on the ship were taken off at 18:15 with dark approaching. Just as Exmouth was coming up on the group at 20:45, Audacious heeled sharply, paused, and then capsized. She floated upside down with the bow raised until 21:00, when an explosion occurred that threw wreckage 300 feet (91 m) into the air, followed by two more. The explosion appeared to come from the area of 'B' magazine and was probably caused by one or more high-explosive shells falling from their racks and exploding, then igniting the cordite in the magazine. A piece of armour plate flew 800 yards (730 m) and killed a petty officer on Liverpool. This was the only casualty in connection with the sinking. Jellicoe immediately proposed that the sinking be kept a secret, to which the Board of Admiralty and the British Cabinet agreed, an act open to ridicule later on. For the rest of the war, Audacious' name remained on all public lists of ship movements and activities. The many Americans on board Olympic were beyond British jurisdiction and discussed the sinking. Many photos, and even one moving film, had been taken. By 19 November, the loss of the ship was accepted in Germany. Jellicoe's opposite number in Germany, Reinhard Scheer, wrote after the war, "In the case of the Audacious we approve of the English attitude of not revealing a weakness to the enemy, because accurate information about the other side's strength has a decisive effect on the decisions taken." This was kept secret at the urgent request of the Commander-in-Chief, Grand Fleet, and the Press loyally refrained from giving it any publicity. A Royal Navy review board judged that a contributory factor in the loss was that Audacious was not at action stations, with water-tight doors locked and damage control teams ready. Attempts were made to use the engine circulating pumps as additional bilge pumps, but the rapid rise of water prevented this. Although hatches were open at the time of the explosion, it was claimed that all were closed before rising water reached them. Apart from the damage to the bottom of the ship, water was found to have spread through bulkheads because of faulty seals around pipes and valves, broken pipes and hatches which did not close properly. Marlborough, of the subsequent (but fairly similar) Iron Duke class, was torpedoed at Jutland and for a time continued to steam at 17 knots (31 km/h; 20 mph) despite damage. The wreck of Audacious was filmed for the television show Deep Wreck Mysteries on the History Channel in 2008. The programme featured an investigation of the wreck and the circumstances of its loss by nautical archaeologist Innes McCartney and naval historian Bill Jurens. The wreck lies upside down at a depth of 58–68 metres (190–223 ft) in clear water at 55°32′16″N 7°24′33″W﻿ / ﻿55.53778°N 7.40917°W﻿ / 55.53778; -7.40917Coordinates: 55°32′16″N 7°24′33″W﻿ / ﻿55.53778°N 7.40917°W﻿ / 55.53778; -7.40917, some 17 miles (27 km) north-east of Tory Island. 'B' turret and part of its barbette was blown clear of the wreck by the explosion. ^ Progress in Naval Gunnery, 1914–1918 ADM 186/238. Admiralty, Gunnery Branch. 1919. p. 37. ^ "The Sinking of HMS Audacious". Royal Navy. Retrieved 28 March 2017. ^ "H.M.S. Audacious: A Delayed Announcement". News in Brief. The Times (41947). London. 14 November 1918. col C, p. 7. ^ "HMS Audacious 1914". Wreck Site. Retrieved 28 March 2017. ^ Bishop, Leigh. "Sheer Scale of a Sleeping Dreadnought". Divernet. Retrieved 28 March 2017. Friedman, Norman (2015). 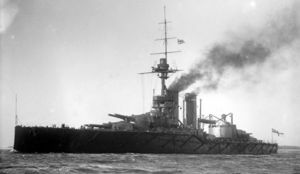 The British Battleship 1906–1946. Barnsley, UK: Seaforth Publishing. ISBN 978-1-84832-225-7. Goldrick, James (2015). Before Jutland: The Naval War in Northern European Waters, August 1914 – February 1915. Annapolis, Maryland: Naval Institute Press. ISBN 978-1-59114-349-9. McCartney, Innes (2016). Jutland 1916: Archaeology of a Naval Battlefield. London: Conway. ISBN 978-1-84486-416-4. Scheer, Reinhard (1920). Germany's High Sea Fleet in the World War. London: Cassell and Company. Wikimedia Commons has media related to HMS Audacious. This page was last edited on 17 December 2018, at 08:02 (UTC).